PhotoToText9 allows you to convert your color photo's/images/pictures into color or blackwhite text version. PhotoToText9 allows you to customize your photos with text. Easy to use all you do is select from two models select your photo and enter any text you like. You can save the photos to text and surprise your special ones as gift for wedding anniversary or birthday. In other words and simply stated, with this simple and interesting piece of software you can insert text inside your pictures or turn them to black and white writing. Given this is a portable tool, no installation is required to use it, hence no changes are made to your PC. Portable PhotoToText9 is a user-friendly and easy to handle piece of software designed to provide you with the means of converting your favorite pictures to textualized versions, by inserting a specific message into the contents of the image, which can be read at higher zoom levels. After downloading the application, you can decompress the archive and run the executable straight away, without having to wait around for an installation process to complete, due to the fact that it is a portable tool. As a result, you can easily store and carry it with you wherever you go, on a USB stick or similar removable memory devices, using it on all compatible systems, without too much fuss. 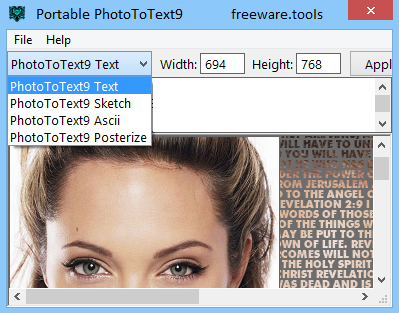 Portable PhotoToText9 features two main methods of transforming your pictures to text, both of which are exemplified in the main window, requiring simply that you double-click on the preferred one to get started. Using the ‘Model 1’ option, the program enables you to load a file and input the text, either manually or from clipboard, then press the ‘Photo To Text’ button. After a brief moment during which the request is processed, you image will be displayed, allowing you to analyze it in detail by zooming into it, or save it to your computer to JPG format. The ‘Model 2’ alternative lets you to load a picture into Portable PhotoToText9, and convert it to black and white text, without inserting a message of your own. Once complete, it can be saved to either TXT or JPG format, depending on your preferences. To conclude, Portable PhotoToText9 is an interesting and fun utility that can assist you in creating ASCII text art out of your favorite pictures, even being able to use your own messages when creating them.